Messaging platforms and chatbots are blowing up. But it’s almost 2017 and you already know that, right? You’re probably ignoring your coworker’s Slack DM right now. Or maybe Alexa creeps you out sometimes but you’re willing to overlook it to conveniently order paper towels. ChatOps may be the hottest trend in software DevOps, but your human resources department can leverage many of the core concepts of ChatOps to benefit your entire organization. As we've covered previously, ChatOps is more than just DevOps on Slack. ChatOps is a philosophy that uses the latest messaging platforms (like Slack, HipChat, and Flowdock) to ensure that specific processes are done more effectively and more efficiently. This post is by Daniel Shank, a Senior Data Scientist at Talla. 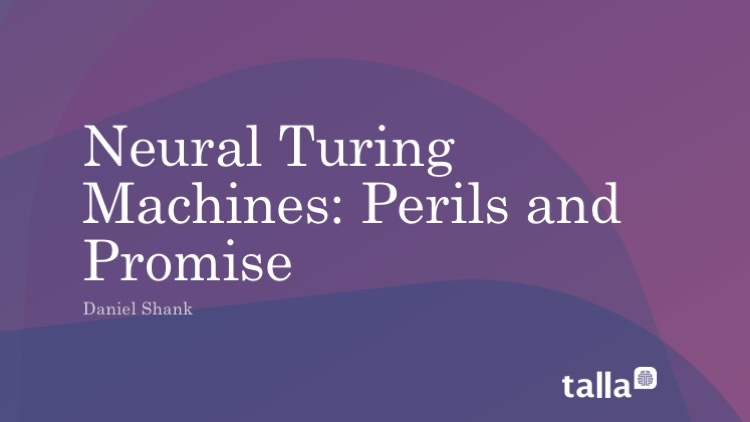 He recently gave a talk at The Machine Learning Conference in San Francisco on Neural Turing Machines. A recording and full transcript for his talk can be found below. Just Google the phrase "employee onboarding checklist" and you'll be bombarded with advice for welcoming a new staff member for your organization. Sources as diverse as the Harvard Business Review to email marketing firm Constant Contact to the Society for Human Resource Management all recommend a pretty standard array of best practices for employee onboarding: have the new-hire fill out critical paperwork, have their workstation ready when they arrive, introduce them to coworkers, and take them to lunch. According to software development thought leaders, ChatOps is the new DevOps because Slack is the new email. If that assessment seems glib, you're onto something—because ChatOps differs from DevOps in more ways than simply using HipChat, Flowdock, or Campfire to notify your coworkers you're pushing code to production. Even when your organization has a robust and thoughtful training and onboarding program, employees aren't always given some basic tools they need to ramp up quickly. Below, we outline items to add to your new employee onboarding campaign -- as in, a process that occurs over time, not during a one- or two-day crash course -- to make sure every employee gets the help they really need to acclimate quickly.